CV Dommer: Andrzej Stepinski Critic & historian of theatre, I’m the member of Polish Kennel Club since 1978. I started breeding with Polish Lowland Sheepdog in 1982 with OLIGARCHIA affix. I bred not so intensive but successful. Among my winners are: 3 World Champions, 3 Club Winners and champions in 9 countries. Since 1990 I have also at home golden retrievers, which I shown and bred not so often, but up today I bred 42 Champions. At the beginning more I handled my friend’s dogs than mine. Mostly there were boxers (also rottweilers and min. schnauzers). It was simple way to own one and I was proud owner of Top Boxer of the year 2001 Ch. Tarantino Nostrum. First time I judged boxers at CC show in 1996. 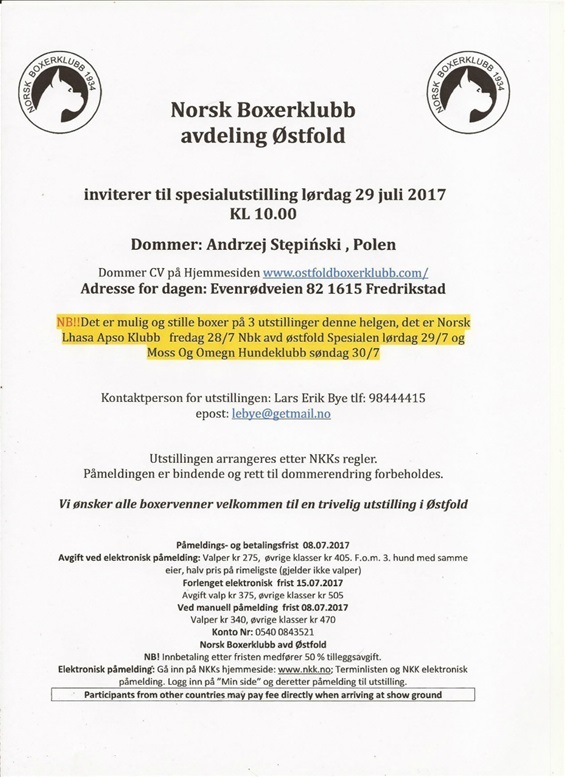 I had the pleasure and honour to judge boxers at the speciality in many countries, as well as such important shows as Amsterdam Winner, Copenhagen Winner, Helsinki Winner, Porto Winner. 2005 – 2009 I was Secretary of Boxer Club. Since 2006 I am President of Retrievers Club. Since 2009 I am the member of Polish Kennel Club General Committee. During last 20 years I judged in almost all European countries. Now I am judge for all breeds from group 1st (without German Shepherd) , 2nd, 5th, 6th, 7th and 8th and also French bulldog, boston terrier, mops, cavalier king Charles spaniel and king Charles spaniel.